Audio Technica ATH-W1000Z review | What Hi-Fi? Few headphones could claim to have the heritage of Audio-Technica’s W series. The ATH-W1000Z marks the 11th generation of a range that started back in 1996 and, as is the brand’s way, is a careful evolution of its predecessor rather than a radical departure. Audio-Technica has tried hard to retain the traditional look and feel of previous W products, and it has succeeded. The look has hardly changed over the years, but at least they stand out. These remain large headphones, intended for use in the home. They’re a closed-back design; good at keeping external sounds out, but also good at not leaking the music being played. Despite their size, the ATH-W1000Z weigh in at 320g, which is still light enough to remain comfortable over long listening sessions. Unlike most similar designs, they don’t warm our ears excessively either. Comfort has always been a priority for these headphones and for the most part the ‘Zs remain true to that aim. Their large earpads are soft enough to block out the outside world, but also exert enough inward pressure to keep the ‘phones stable, even when we move around a little. These aren’t intended for use during exercise, but in the proper context they won’t move around for most people. It doesn’t appear that way at first, though. Instead of using a conventional headband, Audio-Technica has long used what it calls a ‘3D support system’. These cushioned paddles sit on the side of the head and feel a little odd. For most of our test team that sensation fades after a while, but for those with a smaller head, we suggest a test run before buying. 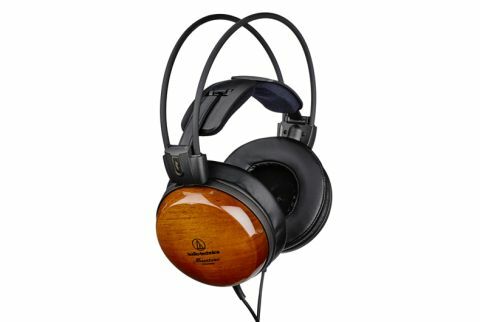 True to tradition, the Audio-Technica W1000Zs sport varnished teak wooden earcups, which are beautifully made. The same can be said of the rest of these headphones – even the synthetic material used on the earpads feels good. Inside each earcup is a 5.3cm drive unit, mounted on a magnesium baffle and decoupled from the wooden structure to control resonances. Magnesium is also used for the frame around the wood where its rigid and relatively low weight properties come to the fore. The ATH-W1000Zs proudly display a High-Res logo on their box – their bandwidth of 5Hz-42kHz is enough to qualify. They are relatively sensitive too, at a claimed 101dB/mW. An impedance of 43 ohms shouldn’t cause matching issues either. Plug in the Audio-Technica’s 3m long cable into a suitable headphone amplifier – we used Chord’s Hugo for most of this test – and they deliver fine results. Our first impression is of a spacious, clear presentation and that opinion doesn’t change with extended listening. These are one of the few closed-back headphones that can stand toe-to-toe with their open-backed alternatives. We start with Bob Marley’s No Woman No Cry and the Audio-Technicas sound right at home. They’re clear, detailed and articulate. They convey the easy-going flow of the music well, and though they lack a little rhythmic drive there’s enough energy to keep us interested. The midrange is unforced, and packed with detail. Marley’s voice is rendered with skill, with convincing texture and tonality. It’s nicely separated from the instrumental backdrop making it easy to follow the various musical strands. The low-end is a touch overstated, but not excessively. It remains agile though, and never threatens to dominate other elements in the song. There’s plenty of power and punch when required too. Moving on to Beethoven’s Eroica shows that the Audio-Technica ATH-W1000Zs are capable of impressive composure and insight. They stay organised and in control even when the music becomes busy. Here we’re aware of their spacious presentation and ability to deliver wide ranging dynamic swings with confidence. It’s a fine performance, marrying insight with plenty of drama. Most of the Audio-Technica’s rivals tend to be open-backed, and the best of these from the likes of Beyerdynamic, Sennheiser and Grado offer more in the way of dynamic subtlety and rhythmic prowess. But, if you need the isolation properties of a closed-back design, there are few better alternatives.